If you stopped watching Agents of SHIELD, I can't really blame you. Like, seriously, there were a lot of moments this past season where I wanted to stop because I just did not care. And that's a darn shame. I can't blame you for stopping, but as I've finally come to the end of the season, I have to give credit where it's due. I'm really glad I kept watching. Admittedly, I watched it sporadically, stopping for months before binging on five episodes at a time right before they were about to expire from my Hulu queue, but I did watch it. I made it. I limped to the end of the season. I feel like I'm not making a very strong case in favor of watching this. Hmm. Let's try again. 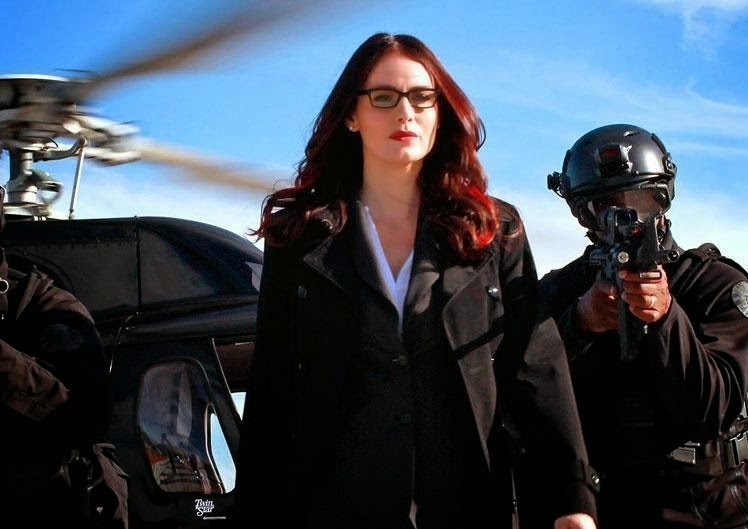 Coming out of the gate, Agents of SHIELD was pretty strongly underwhelming. While it does tie in to the Marvel Cinematic Universe, it does so in slightly simple and dull ways. Our "tie-in" to Thor: The Dark World was a scene of the characters cleaning up after the movie and moving rubble around, then having to fight some vaguely Norse bad guys. The episodes were, well, episodic, and usually kind of dull. 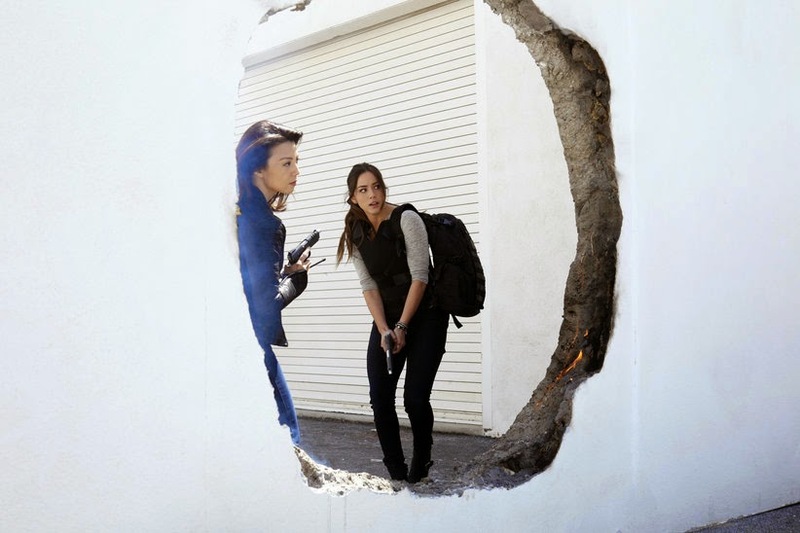 The arc-plot of the season, at least so far as was evident for the first fifteen episodes or so, had to do largely with Agent Coulson (Clark Gregg) and how he's not dead, and with the origin of new agent Skye (Chloe Bennet), who is an orphan with a very shady past. That she doesn't know about. It's not that those were bad storylines, but more that they didn't live up to the promise of the Marvel Cinematic Universe. I mean, we're all used to the concept now, and fully disappointed in it, let's be real, but remember again what this show had going for it as we entered the season: a Joss Whedon produced show about the nitty gritty behind the scenes of the Marvel universe, featuring a beloved character back from the dead and another awesome character played by Ming-Na Wen (who freaking voiced Mulan), as well as cameos by actors from the Whedon-verse and tie-ins to the extremely popular and amazing Marvel films. It was supposed to be awesome. The best thing ever. So cool. And it wasn't. Here's the thing, though. The show did get better. Good enough, even, that I don't regret powering through the season and am actually really glad I did. The turning point came after Captain America: The Winter Soldier came out. The episodes from there to the end of the season dealt explicitly with the fallout from the film, which did happen to be a bit about SHIELD. You know, the thing where SHIELD has been secretly infiltrated by HYDRA and the whole organization has been branded as terrorists and is being demolished by infighting, a virtual civil war, and military intervention. Once we got there, we were good. Why? Because finally, finally the show was about something bigger than its characters. With a larger fight to unite and divide them, at last there were stakes to the show, a reason to keep watching, and the general Whedon-fear that someone you love wasn't going to make it out alive. I tell you this not to castigate the show, but because I'm actually really proud of it. It improved. It got better. I know that sounds super dull as a sentence, but I don't want to lose the importance of that. It's pretty unusual for a show to manage to go from dull to good within the span of a season, especially without being cancelled. I can think of a handful of examples, but not a lot. There are so many obstacles in the way of a show shifting gears like this one did. Especially in the way of a show connected to so many franchises and companies. Let me be specific. SPOILERS for the second half of the season from here on out. Captain America: The Winter Soldier dealt extensively with the idea of HYDRA having infiltrated SHIELD. It showed the battle to take back control, and it even gave us an up close and heart-wrenching vision of how SHIELD must ultimately be destroyed in order to root out HYDRA and save us all. Then the movie fast-forwarded a couple of weeks to show us the aftermath and how everyone was coping. What we didn't see was the immediate repercussions. We didn't see what happened to all of the (presumably thousands) of SHIELD agents who weren't at the Triskelion that day. 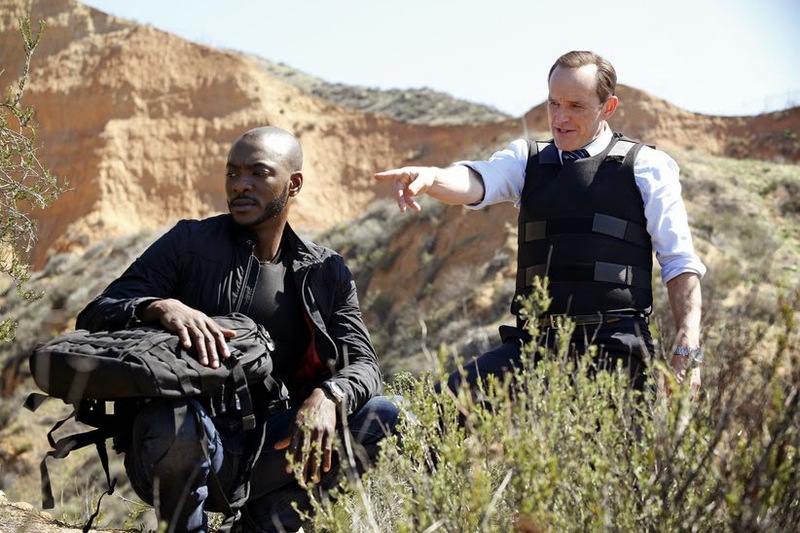 Which is precisely where Agents of SHIELD came in, and where it ought to have come in. All of a sudden, our heroes, who had split up to deal with their own crisis, were faced with an even bigger problem: the destruction of SHIELD, the defection of HYDRA, and their new classification as agents of a terrorist organization. To make it even worse, like I said, the team wasn't together, and one of its members, Simmons, was trapped in a SHIELD facility while a battle raged between HYDRA and SHIELD agents. Simmons being a scientist, she wasn't super equipped to deal with it, oh, and she was trapped with the second-in-command of a man they'd just found out was pretty much a supervillain. Not a good day. What followed then was an intense and emotionally wrenching hour of television, where Simmons and Triplett (the agent she was stuck with) were tested and had to trust each other and shot at and bonded and all that good stuff. Then we found out that while Triplett wasn't HYDRA, our good friend, Agent Grant Ward, one of the series regulars and stars of the show actually was. And that, my friends, is precisely where the entire season of powering through this show finally paid off. All of a sudden, all those scenes of Grant interacting with the team, all that stuff where he slept with Melinda May or bonded with Skye or saved Simmons' life, gained a whole new dimension. And honestly became a lot more interesting. But more than that, by making Grant a regular cast member, allowing us to love him, and then making us HYDRA forced the audience to humanize the problem in a way that Captain America: TWS, by simple virtue of its plot, couldn't. We now knew a member of HYDRA, intimately and deeply, and we had to figure out what was lies and what was okay and oh my gosh what was going to happen now. Basically, by making Grant a member of HYDRA, the show forced the audience to feel the betrayal felt all over SHIELD as people discovered that their coworkers, friends, even lovers, were actually members of an underground terrorist organization. By letting us get attached to him and then making him the villain, the show finally did what it said it was going to: it made us look closer and it made us part of the action. The rest of the season is a whirlwind of great episodes, as we the audience know about Grant's betrayal, but the characters don't for a long time. We had to watch him scheme and plot and kill, while we also saw the team dealing with their new lives and choosing whether to stay or go. And then we got a pretty sweet plot where our little band of misfits had to stop HYDRA and save the world. You know, no big deal. All of this wouldn't have made any sense or been at all appealing, however, if we hadn't had a whole season of relatively low-key bonding to build up to it. Without the whole first season, bland as it sometimes felt, we wouldn't necessarily feel the same rage at Grant when he defected and we definitely wouldn't feel the same satisfaction when Skye told him off or when Melinda May delivered the smackdown. Now, I'm not saying that with this ending in mind the season is perfect. It's not. It's still boring as hell. I mean, I get what they did and I appreciate it, but I really did not enjoy it at the time. Booooooring. What I'm saying is that the show finally paid off, and I appreciate that. I appreciate that it finally built on its foundation and gave us a story worthy of the Marvel Cinematic Universe. Plus, it was damn satisfying from a storytelling perspective. The finale itself was thoroughly enjoyable, partly because it was really well written and acted, but also because the storylines covered in it were ones that we'd had enough time to digest and appreciate. Fitz and Simmons, trapped in a box on the bottom of the ocean, with only enough oxygen for one of them to survive? That would be a good setup for any two characters, but these two especially made it sing. It worked because the two of them had spent the whole season up until this point dancing around their feelings for each other. Sacrificing and loving and touching ever so fleetingly but never addressing it until Simmons called Fitz her best friend and he told her that she was so much more than that. Or how about the scene where Skye and Melinda May, two characters who have been at odds throughout the entire season, bond over dealing with their anger and frustration and rage, then do one better and deal with it. Instead of taking it out on each other, they harness it and take it out on the person who deserves their censure: Grant Ward. More than that, though, I loved finally seeing these two fantastic women sitting down and understanding each other. Why can't we have more of that. I only wish we hadn't had to wait a whole season to see it. 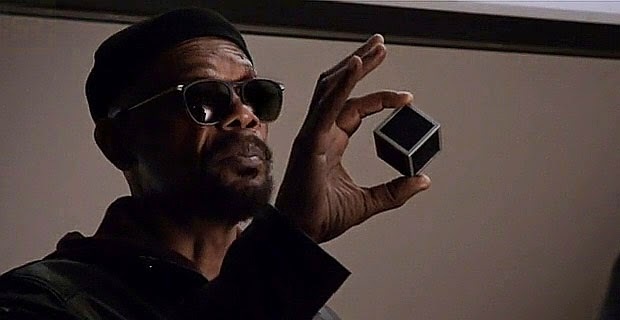 Finally, who didn't love seeing Samuel L. Jackson turn up unexpectedly in a helicopter and save everyone, snarking all the time, and point out that he was dressed like someone who "lives under a bridge". His rapport with Coulson was, of course, amazing, as was the scene where we discover that the bad guy's entire motivation comes from his mishearing of one of Fury's speeches. That was priceless. Less thrilling was the overly sentimental way the show chose to close out its "Why isn't Coulson dead?" storyline - because he was an Avenger and way too important blah blah blah - but I did like the twist at the very end. The show finishes its first season with old SHIELD destroyed and a new one to be built from the ashes, by none other than Coulson himself, as the new Director. There's a lot of promise going into the second season, and I totally love the turn the show took as it developed and grew. Honestly, I appreciate that they managed to course correct so much and so well. That takes skill and guts. 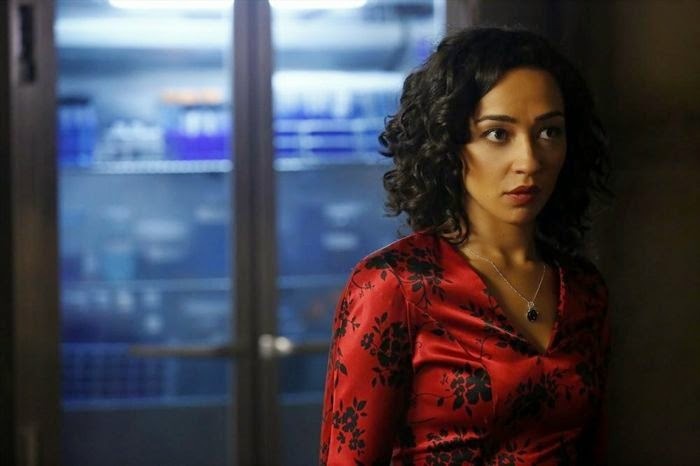 I do have problems with the season overall, like how they killed Agent Victoria Hand, one of the only high-ranking female characters we ever see, and how it took an entire season for two of the most important female characters on the show to have a freaking conversation. I could do without the way that everyone is constantly falling all over Coulson and making him out to be the savior of the world. But generally, I'm good. I'm glad I stayed. I'm excited for next season. I'm even more excited for the Agent Carter series that we have coming, but I can honestly say that I look forward to Agents of SHIELD coming back. This show surprised me, and rewarded me for sticking with it. It finally did something with its female characters, it finally resolved Mike Peterson's storyline and didn't resort to insulting stereotypes, and it left some good interesting mysteries going for the next season. So, if you give it a chance, it might surprise you how much this show improved. But then again, don't we all remember how effing terrible season one of Buffy is? Its was very getting through the first few episodes. I only watched 2. Can i jump in after winter soldier or will i then miss too much of the plot? I think you could pretty safely jump in at the episode "TAHITI", but if you go straight to the episode after Winter Soldier, it's not going to make a lot of sense. There's some setup about the season villain (who I didn't mention in here) that needs to happen. Still even just skipping up to TAHITI will get you past most of the dreck. So it's May who takes him down? Excellent, I was afraid it would be Coulson. (No disrespect to Coulson, but it should totally be May). It is the most beautiful smackdown in the history of smackdowns. Plus, the phrase "ragefu" is used, and that just makes me happy. I've finally had a chance to see this, now. And in sum, glad I did. Even the first episodes were fun, they were just more frothy. I loved the fight between May and Ward. And while a one-sided beatdown would have been nice in its way, the brutality of it was good too - in the sense that it was a fight May could easily have lost, because Ward was bigger, stronger, and about as good - but she was more resourceful and used her environment 12% better. Which makes her winning all the more satisfying. Sky facing him down was awesome too. Actually, though, there is another fight of May's I like just as much: facing several supersoldiers and a smirking guy with the beserker staff. And she disarms the latter, because she can hold the thing and stay focussed as well as getting strong, and then uses it to send several of the supersoldiers flying and cave the cellar in. Actually, there was a clever bit of forshadowing in the episode the staff first appeared in. The hate group, no matter how angry and beserk they got, never turned on each other. It's a weapon for an army, and an army can't survive if it's soldiers fight their own. But Ward had to constantly fight not to - why? Well, because it's more dramatic for that sort of episode, which it totally what we'd assume is the reason. But in hindsight, of course, they're *not* his own. Gugh, I use the word "actually" way too much. I've seen a lot of talk on tumblr about Ward, and it's made me think. When he was outed as HYDRA, i was pissed as hell. As were we all, really. And it was frustrating to see people mourn for him, because he's a freaking NAZI, guys! We know what HYDRA did to people in the forties, what they did to Bucky, and what they've been up to in between movies. Ward is a part of that and I hate him. But...the rest of the season came around. Garrett wasn't the guy he happened to work with, he's the guy who freaking brainwashed Ward. Leaving him in the middle of nowhere for months, forcing him to fall into a pit of despair and only see Garrett himself as his savior, and teaching him to only make connections with people he can use later for his own will. That's sick. And it's abuse. This is turning out to be longer than i meant it to be, but what i'm saying is that I love this show, mostly because they're willing to blur the lines between what we see as good and evil. Ward made his own choices, influenced as they may be by his past. I'm not saying he's guiltless, but he's not a cookie cutter villain. In real life, I fully believe that someone's past may explain why they are the way they are, but it doesn't give them an excuse. Mike Peterson was physically forced to do Garrett's bidding, but chose to fight back the second he could. Ward didn't know which way was up when he was given free reign. They're good foils to each other, and while it still bugs me that so many fans will ignore someone's wrongdoings because they're cute, I love that this show is presenting a character that's so incredibly complex in an incredibly complex situation. I think it was especially interesting that very bit at the end where Ward was clearly trying to warn them about what was coming, but he couldn't because May had fractured his larynx. I like the concept of his working for redemption/trying to understand the world as it really is, and his new moral reality. But I also like the idea of it taking a very very long time. Basically, I don't think we've seen the last of Grant Ward, and that makes me very happy.